Ms. Jarrett on stage at Union Chapel with author Richard Taylor. When Valerie Jarrett was working as deputy chief of staff for Chicago Mayor Rich Daley, a young woman came in for a job interview. When Michelle Robinson introduced herself, Ms. Jarrett did not know she was talking to the future first lady of the United States, but she was impressed. 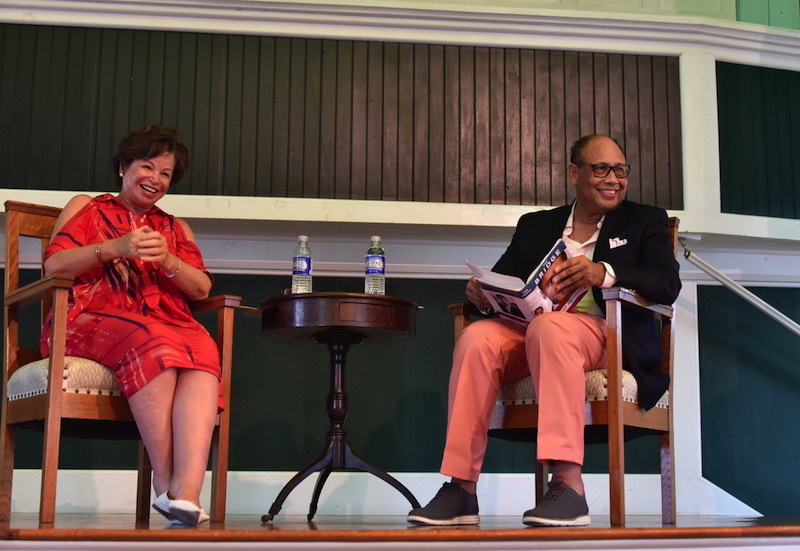 “She shook my hand, and she looked right at me and we sat down to chat,” she recalled Thursday afternoon at the Union Chapel in Oak Bluffs, where she joined Oak Bluffs author Richard Taylor to discuss her life of public service and role as President Obama’s senior advisor. 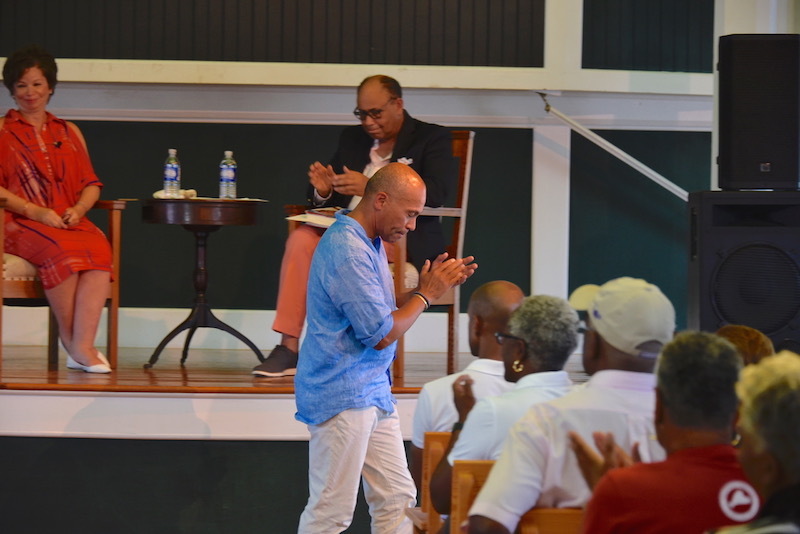 The chapel was packed and Ms. Jarrett was greeted with a lengthy standing ovation. Former Massachusetts Gov. Deval Patrick introduced her. Ms. Jarrett said her interview with Ms. Robinson was scheduled to last 20 minutes, but they talked for an hour and a half. “She just blew me away, so I said you’ve got the job. I had no permission to give her a job, I didn’t talk to anybody about it, but I just knew she was perfect,” she said. Ms. Robinson got back to her a few days later and there was a problem. Ms. Robinson explained that her fiance was Barack Obama and he had worked as a community organizer on the South side of Chicago, often protesting against city government because of the inequities he saw there. The couple was worried about the optics of her working for the mayor. Mr. Obama suggested they all three go out to dinner to talk about it. It was a strange proposition but Ms. Jarrett accepted. It was the beginning of a long friendship and career as advisor to the Obamas, first when Mr. Obama ran for state senator, then unsuccessfully for congress, then for senate and finally for president. “Am I ever glad I went out to dinner with this couple!” exclaimed Ms. Jarrett. She spoke about the challenges President Obama faced when he first took office. Rising unemployment, an economy on the verge of collapse, and two ongoing wars made for a daunting first term, but she said there was never a day she wasn’t proud of their work. “I loved my job. I just loved it. I felt like my whole life I had been preparing for this,” she said. Mr. Taylor asked about President Obama’s focus on justice, specifically when it came to prison reform. She said the president commuted more sentences than the last 11 presidents together. Many of the sentences were for life in prison for nonviolent drug offenses. She told a rapt audience how Mr. Obama wrote each person whose sentence he commuted, telling them he believed they had the ability to turn things around. One audience member asked how the public should understand the Obamas’ role today in light of a new administration that continues to reverse course on many of their initiatives. More than once Ms. Jarrett took the opportunity to single out Mr. Patrick, who sat in the front row. “As I have been saying to Deval Patrick, I have a very good eye for talent,” she quipped, an open reference to the fact that the former governor is reportedly considering a presidential run. 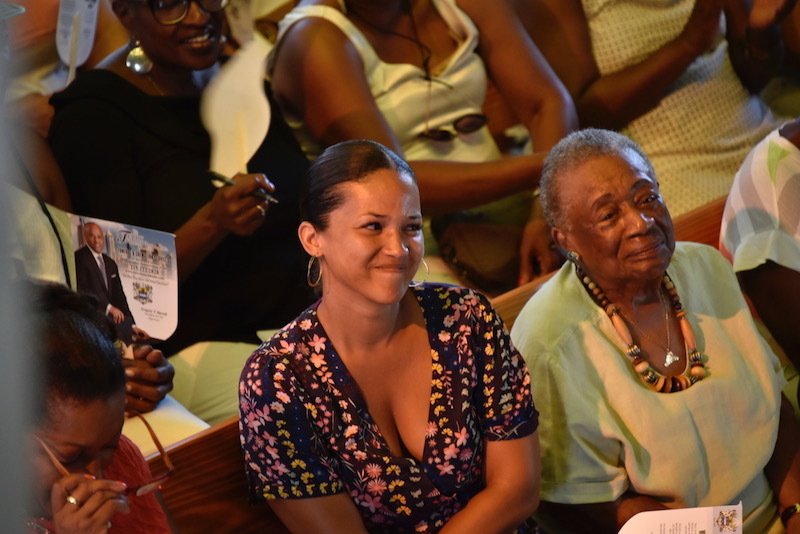 She also took a moment to honor her mother, educator and author Barbara T. Bowman, and her daughter, journalist Laura Jarrett, who also sat in the front row. “I wouldn’t be who I am without my family,” she said. She said she has been visiting the Island since she was 10 years old. The event began with a moment of silence for Aretha Franklin, who died early that morning. 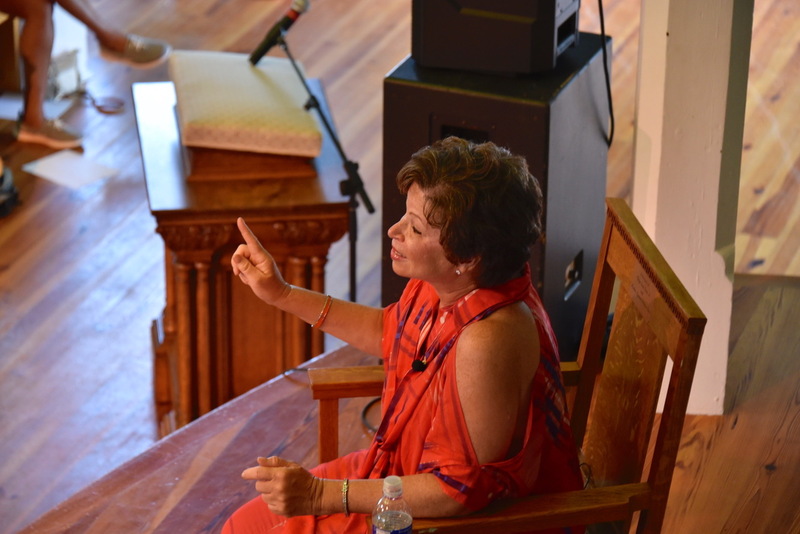 Valerie Jarrett is all class and i hope she comes to Tampa at the USF lecture hall. It would be such an honor to see and hear this fine educator. I was there and she spoke to a friendly crowd who did not ask about any of her huge mistakes. Fast & Furious, Libya, why she met with Bill Clinton on a plane while Hillary is under investigation it would of been nice to hear her own words now to see how she spins these issues. Yes the criminal justice system is wrong and we all can see that. Business as usual still going on in Washington. If it is the party you like the mistakes are not important. Bob...please get your facts straight before commenting! VJ did not meet with B Clinton. It was Attorney General Loretta Lynch. Bob: Valerie Jarrett met with Clinton on a plane? Are you getting your black women mixed up? Fast and Furious as well as Libya involved government agencies that she had nothing to do with. If you think anything happened in the Obama whitehouse without Valerie's fingerprints on it then all the books I have read and Judicial Watch must be wrong. And I brought up the Loretta Lynch disaster as an example of the many mistakes no one will bring up on this Island. Enjoyed reading information and news provided. Though writer Bob seems a bit confused with his facts it is true Valerie Jarrett was an influential advisor yet she could not be everywhere at once. I was a supporter of the Obama administration but did not agree with every policy and practice. A discussion at Union Chapel among friends is just that not a forum for dispute and disagreement as reader Bob may have liked. Yes this is the Vineyard and a family discussion was the pretext for my invitation to VJ. But I did ask if there were regrets and if there was unfinished business. She is a great public servant and Obama “ friend” so glad so many enjoyed the afternoon.